David Francis makes it back to back ranking title victories! 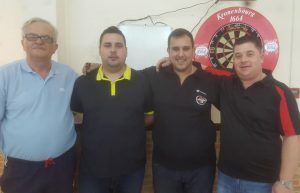 The 4th ranking of the season yet again enjoyed a brilliant turnout with a total of 44 players taking part in the event. The night once again belonged to David Francis who made it back to back tournament wins with a brilliant display of form throughout the night. David, who had won the last ranked event wanted to prove that his last tournament win was not a one off and he has shown this by winning another ranked event. David is clearly becoming one of the top players in Gibraltar and this season he is in contention to break into the top 4 of the Gibraltar Darts Rankings. In the Quarter finals of the event we saw some top competitors go head to head with Dyson Parody getting the better of Tony Dawkins 4-1 on board one. Board two saw Dylan Duo ease past Nathan Old 4-0. On board three David Francis managed to whitewash one of the GDA’S top player Justin Broton 4-0, while Francis Taylor enjoyed a 4-1 win over Jadrian Pecino. Dyson Parody faced off the local legend in Francis Taylor who had not made a semi final appearance in sometime. Dyson went on to clinch the match 5-1 in an impressive display against 68 year old Francis Taylor who still shows impressive form. The other semi final was a much closer affair with David Francis getting the better of Dylan Duo 5-3, this game had everything with both players hitting each other hard with big scores and high checkouts. But it was David who managed to get the crucial break of throw in the end and this gave him a huge advantage to clinch the match. David continued his fine form into the final. He managed to dominate the game early on, he quickly gained a 4-1 lead over Dyson, who had missed some crucial chances early on but it was David who punished him and quickly winning the title 6-1 with a dominate display.